Digital Devices 64K Printer Buffer Info? I recently sprang for a Digital Devices 64K Printer Buffer Kit from Best Electronics. There's a custom ic I've never seen before included in the kit. I've tried a google search and came away with nearly nothing on it. Does anyone have pinouts/data etc on it? Would pictures of the board in a 32K Printer Buffer from Digital Devices help at least with backtracing and maybe deducing the lines back to the chip? If so, I can help with that, at least. Thanks for the offer, but I have the bare board as part of the kit, so I'll be able to trace lines fairly easily. What I am trying to find out is what the chip is..... what can replace it..... etc. Since I'm finding so little info in a google search I'd guess the chip is not very common. What about this post and the responses which come after, Dropcheck? Same manufacture, but the Ape-Face appears to be just a printer interface. Interesting though. I'll try to pm the last poster to see if he/she is still on AtariAge. Maybe he has other info. 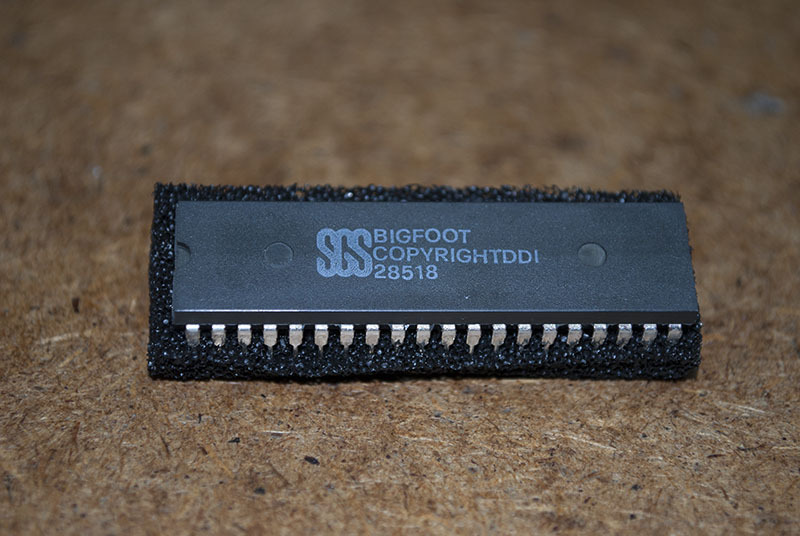 The copyright stamp implies it's a microcontroller with custom ROM. I once had a 64K printer buffer based on the 8048 microcontroller. The firmware ran the dynamic RAM directly, no hardware multiplexers nor refresh circuit. Is that how yours is wired too? Can you post a photo of the board? Here's the scan of the one sheet instructions I received to put the kit together. It's my thought that this is a microcontroller too, hence the crystal. Just have nothing else to go on as to what kind of microcontroller. Edited by Dropcheck, Thu Aug 3, 2017 5:16 AM. SGS Microelettronica from Italy merged with Thomson and eventually changed its name to STMicroelectronics. Perhaps you can get some information from them? Your sheet says the 7 MHz crystal connects to pins 2 and 3 of the SGS chip. It so happens that the 8048 takes a crystal of 1 to 11 MHz on the same pins! It's a longshot, but who knows, perhaps it's the same P Nodwell (used to live in Atlanta, GA). It would be the same timeline. But why disguise the id of the chip, unless there are differences. I've gotten a reply to the pm I sent. The user claims to have all manner of Digital Devices inventory following their shutdown years ago, including schematics of products and extra chips. I made the request for info on the chip and he/she said would get back to me after checking his stash. We'll see. Thanks for the info Tim. Looks like it might pan out. I’m the guy (not gal) you were Private Messaging and it is your lucky day. 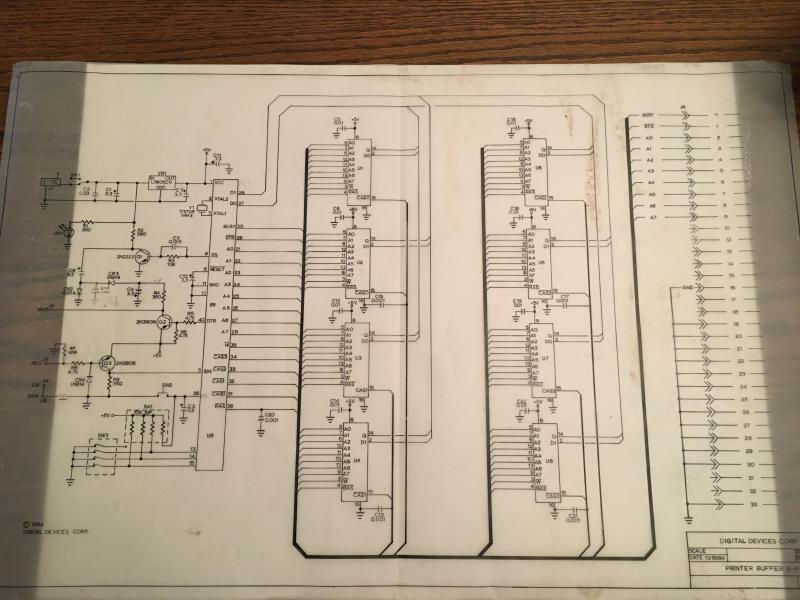 Attached are pictures of the original pencil drawn schematics of the parallel buffer and the ink velum of the serial buffer. It’s a miracle that I still have these and was able to find them. My name is Richard Taylor and I was the warranty repair department, shipping department, prototype builder, janitor, etc.. at DDC (Digital Devices Corporation) while I was going to Georgia Tech in 1984/85. Paul Nodwell was the Engineer/part owner and we have not heard from him since we closed the doors. Oooooh the stories I could tell about the good ol’ days at DDC. It was an incredible experience for an aspiring young Engineer. My first two computers were a 400 and 2600, so Atari has been a huge part of my life. I love seeing old equipment resurrected and will help where I can. I’ll dig in to my boxes of stuff and see if I can revive some damaged brain cells, but I remember the original APEFace was a Z8601 with a separate EPROM. This later evolved into a custom CPU with the program burned in to an internal ROM. The original printer buffer never had a separate EPROM. I spoke with the other engineer years ago and he said there is a way to bypass the internal ROM and use it as a standalone 8601, but can’t remember how and have not heard from him in 20+ years. I still have 1000’s of these old chips, boards, and components. Looks like I'm going to have a busy weekend. You're right. So much of the Atari computers and accessories information has vanished over the years. I've moved at least a few dozen times in my life and losing bits and pieces of this and that always seemed to happened regardless of how important it was to me. Things just seemed to vanish into a black hole on move day. That happened even when it was something I used nearly every day. I remember the 2600 that we kids bothered Dad long enough to buy, but I didn't get involved in computers until a Cobol class using punch cards in college. It wasn't until a few years later I bought my first personal computer, the 800XL with a 1050 disk drive and 1027 printer. JC Penny had a sale going on, but it still cost nearly $600. Now Atari as a computer company is long gone and it doesn't look like JC Penny will be around too much longer either. We need a wayback machine. Looks like the Z8611 PLCC 44 pin version has a ROMless pin that you can disable the rom, but apparently per the datasheet the Z8601 40pin DIP doesn't have that option. At least a sanctioned method. Would it be possible to get a listing of what you have? Different versions of chips, boards etc. It will take a while, but let me see what I can put together. It doesn't have to be exhaustive in the exact # of each item. Most of the common items I think we can get commercially. I'm mainly thinking about the custom chips, hard to find crystals, custom boards, cases, etc. A question about the schematic with the serial input: Do you know what the signals are coming in on J2,J3,J4 and J5? I see the color indication, but sometimes the SIO wires were not exactly red or yellow or green etc. No, I do not remember and not sure if I have one of these assembled to check against. Just guessing, I would say J2 is DTR since it triggers pin 40 on the Z8 and it is labeled DTR. Since Tx is not needed, I would assume J3 is Rx, plus it is tied to pin 5 which is labeled SIN (signal in?). That would leave J4 and J5 as GND. It appears that J3 would be DATA OUT, J4 and J6(I think it looks more like a 6 than a 5) are ground. That leaves J2, I think the +5V/READY signal may being used to signal DTR. But how do you get data into the buffer? There appears to be two external connectors. One is the Centronics port which I would think would be connected to the printer and the serial input lines J2, J3, J4 and J5. Am I backwards in this? From the schematics it appears to me that there are 2 different versions of a print buffer. 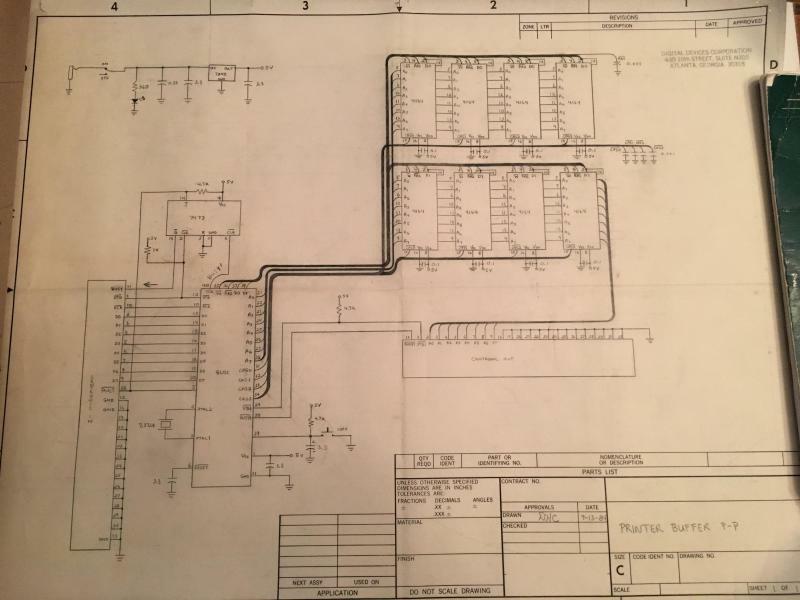 The text in the bottom right corner the top schematic is "PRINTER BUFFER P-P"(parallel to parallel), which should work inline with any parallel printer interface. The text for the bottom schematic is "PRINTER BUFFER S-P", the S could stand for serial or SIO. If this is designed for RS232 signaling then an R-Verter interface would probably be needed first to convert from SIO signaling. There could also be different firmware for the device, one to handle SIO signal levels and another for RS232 levels. The schematic of this device shows connections from the controller(U9) to the RAM(U1 to U8) then to the printer port(J6). For some reason I was thinking the second schematic was using a direct connection to the Atari SIO port and the signaling you gave was confusing me. I can see that it likely is RS232 instead. Now it makes more sense.